How Does CBD Work for Inflammation in the Body? How Does CBD Work For Inflammation? A little inflammation is fine. It's actually an important tool of our bodies to not only protect us from foreign intruders but to rebuild tissue. The problem is when it doesn't get turned off. Or worse yet...attacks our own tissue! That's where we get into trouble and most major diseases are intimately tied to inflammation. Maybe some diseases that you wouldn't expect. Just recently, a study linked immune response from psoriasis treatment to cardiovascular disease. Our study presents evidence that there is a sixth factor, inflammation; and that it is critical to both the development and the progression of atherosclerosis to heart attack. If you read through this site, you'll see they're playing catch up. Sure, we can guess about a connection with arthritis or gut issues. What about plaque build up in our arteries? What about the autoimmune diseases (take your pick from the latest TV or magazine ad for a medication)? Put a check mark by any and ALL of those issues for inflammation. Which begs the question...why is our body's inflammatory response so under fire? Great question and we'll touch on that below. We'll also look at how CBD might just be the biggest and newest ally in our fight against the "wrong" kind of inflammation. We'll look at all of it. People (and marketers) throw the work "inflammation" around like it's a tangible thing. First, inflammation is a product of the body's immune system. 80% of that system is in the gut which will make sense after reading below. That's where we come in contact with the outside environment most directly (via food). Viruses, bacteria, mold, and all sorts of poisons are hitchhiking with our food. There's no way around that. Bacteria inside and on us outnumber our cells 10,000 to 1 and we have over 37 trillion cells! So the immune system is on constant alert to go after anything that might be dangerous to us. The two different targets shed some insight into both the positive and negative aspects of inflammation. On one hand, if our immune response doesn't win, we don't survive. However, within the inflammation itself are powerful chemicals the body uses to rebuild and repair (for example, after injury). That's why anti-inflammatories like NSAIDs (ibuprofen for example) can interfere with the rebuilding of tissue and lead to a higher chance of re-injuring! The anti inflammatories are doing just that...cutting the inflammation process short but therefore bypassing the needed process for correct repair of the actual tissue. So, we need inflammation. It's important to our survival and success! So why all the hubbub about inflammation? Think of inflammation as any army. Yes, it fights the enemy but there's always collateral damage. It will also cause some damage to our own surrounding tissue. This is a sad fact of war even within our own bodies. Sometimes, the immune system goes haywire and attacks everything! In fact, it can even target our tissue directly. Pick an organ or system in the body and there's probably a disease where our immune system mistakenly attacks it. Why is the body's immune system going out of whack so often these days? Take a look at around you right now. Keep in mind that the immune system has been slowly crafted by trial and error for millions of years. It's enemies have been pretty consistent over that time. It knew the usual cast of bacterial and viral characters. New ones would pop up occasionally but for the most part, it was business as usual. Enter the new age of chemistry. The immune system is taxed. It has to assess and respond to all these new actors on the scene. A recent report showed a link between the Gardesil HPV vaccine and MS in teens. Albeit a small sample, this follows a wider French study showing the potential link with GBS, a disease where the immune system attacks nerves. A new study showed a tie between long term use of ACE inhibitors, a very popular blood pressure medicine given to millions, and lung cancer (due to contaminents). The mechanisms isn't known yet but there's a clear tie between certain cancers and inflammation (see CBD and cancer page). Antibiotics used in food has shown a relationship with obesity as they impact the gut bacteria which are starting to appear at the center of everything these days. Check out research on CBD and gut bacteria here. These are all examples out of millions of what our immune system is NOT designed to deal with. Or at least, not at the levels sent its way. We now have glyphosate, the very popular pesticide in umbilical cord blood. Glyphosate, like most pesticides, is a neurotoxin. That's how it kills pests. Unfortunately, we use the same pathways for passing messages and developing brains. Guess what system has to respond to all this. It's primary weapon of choice? So...what does any of this have to do with CBD and the endocannabinoid system? 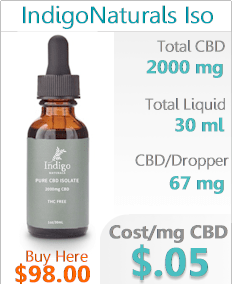 You can always check out the How CBD Works or the CBD Beginner's Guide but here's a quick overview. The endocannabinoid system runs through all our bodies. These systems are incredibly complex and they all interact with each other. In terms of inflammation, the immune system is our first goto but don't discount hormones and neurotransmitters. It's a symphony of chemistry that delicately balances between too little and too much at each choke point. Most of our modern living (chemicals, antibiotics, pesticides, etc) falls on the immune system. We have two types of cannabinoids. Those found naturally in our body (like anandamide and 2-AG) and those found in the cannabis plan (CBD, THC, CBN, CBG, and dozens of others). They all interact with this one system and the current thought is that CBD and outside cannabinoids are used as needed by the system when it runs low. Overall, cannabinoids have exhibited significant potential to be used as novel anti-inflammatory agents and specific targeting of CB2 receptors holds the promise of mediating immunosuppressive effects without exerting psychotropic side effects. It is increasingly recognized how tightly this expanded ECS is intertwined with key processes involved in inflammation. The endocannabinoid system is intimately tied in with the inflammatory process. Let's dig directly into the research data on cannabinoids and CBD specifically for inflammation. Data is pointing to CBD being a very powerful anti inflammatory in the body. This is not surprising since the endocannabinoid is directly implicated in balancing the immune system where inflammation originates from. Look at the sheer breadth of effects the endocanninoid system is affecting! That's why it is so exciting. We're talking about a difference in kind versus scale. The endocanninoid system appears to sit up above the sub systems we're bashing about with our current medicinal strategy. Enough generalizations...let's look at research. We're going to bounce around the body and brain. It's very interesting that you can pick a body part (skin, brain, heart, organ, etc) and CBD appears to help balance the inflammatory response. We'll start in the gut...where the immune headquarters reside and inflammation "decisions" are primarily made. CBD was shown to help the endocannabinoid system move toxins across the gut lining and out the body. Otherwise, they build up there and cause inflammation. Let's put a checkmark next to possibly helping IBS, GERD, Crohns, Colitiis, etc. Bringing down inflammation in the gut goes a long way towards lowering it throughout the body. 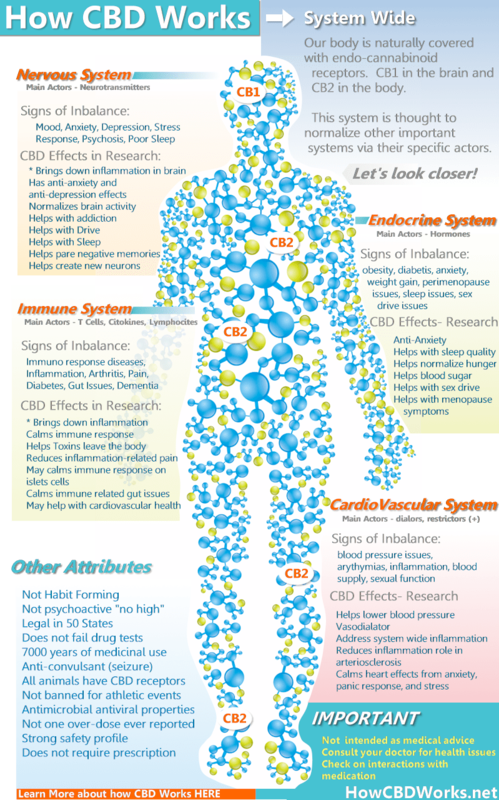 You can learn all about CBD and autoimmune here or CBD and the gut here. We'll wrap this section with why that's true according to research later. First, cannabinoids help to manage the creation/death of immune cells which is important. Too much of a good thing can be bad....and end in things like psoriasis. One major mechanism of immunosupression by cannabinoids is the induction of cell death or apoptosis in immune cell populations. Let's look at actual results please. We'll start with specific actions of CBD on the inflammatory pathway. IL-6 and Tumor Necrosis Factor are both markers of inflammation. we show that cannabidiol has anti-inflammatory effects in a murine (mouse) model of acute lung injury and that this effect is most likely associated with an increase in the extracellular adenosine offer and signaling through adenosine A(2A) receptor. its modified derivatives significantly suppress chronic inflammatory and neuropathic pain without causing apparent analgesic tolerance in rodents. Keep in mind that inflammation is often associated with pain and some diseases are the direct result of inflammation in the nervous system itself. That's good news for people with fibromyalgia, diabetes, and Parkinson's. Looking at ulcerative colitis, an entirely different pathway for inflammation involving the glial cells (immune cells in the nervous system which extends to the gut as well). CBD markedly counteracted reactive enteric gliosis in LPS-mice trough the massive reduction of astroglial signalling neurotrophin S100B. 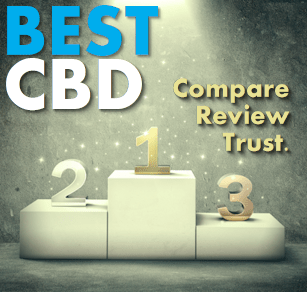 Our results therefore indicate that CBD indeed unravels a new therapeutic strategy to treat inflammatory bowel diseases. Let's jump from the gut and nervous system to the eyes. Current data suggest that CBD inhibits diabetes-induced retinal inflammation by the same mechanism (unpublished observations). Umm...that's the leading cause of blindness. Why isn't this front page news! Let's jump from the brain to an organ with some importance...the brain! What about Alzheimer's and Dementia inflammation? Results showed that the blockade of PPAR was able to significantly blunt CBD effects on reactive gliosis and subsequently on neuronal damage. Moreover, due to its interaction at PPAR, CBD was observed to stimulate hippocampal neurogenesis. That's science speak for "building new brain". In the hippocampus, a ridiculously important area for memory, emotions, and motivation. Learn about CBD and neurogenesis here. Raise your hand if memory, emotions, and motivation are important to you! We looked at brain, what about heart and arterial health. Endothelial cells line the interiors of blood vessels and lymphatic vessels, the very root of cardiovascular issues. CBD brought down the inflammatory response to high sugar (important for diabetics specifically but for heart health more generally). Remarkably, all the above mentioned effects of HG were attenuated (reduced) by CBD pretreatment. What about the inflammation that follows acute injury and of course the accompanying pain? CBD, administered 2 h after carrageenan, abolished the hyperalgesia to the thermal stimulus evaluated by plantar test. The word they used was "abolished". Pretty bold for researchers who prefer the more demure "attenuated". Aside from the inflammation requirement for many cancers, there's the current treatment of it which can include very toxic radiation and chemotherapy agents. 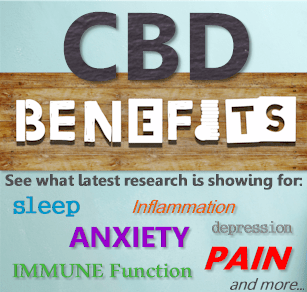 How about CBD to counter this intense inflammation in health tissue including kidney failure and inflammation overload? CBD may be of significant therapeutic benefits against the renal complications of cisplatin chemotherapy by attenuating oxidative/nitrosative stress and cell death. Remember how we talked about inflammation is needed to rebuild tissue? NSAID's can alter the correct repair matrix in this process. CBD works along a different pathway and is showing positive effects in regards to "fibrosis" or scarring. Ultimately, this process results in an increase in the rate of resolution of chronic inflammation. The "resolution" of inflammation is important. Remember the issue with "chronic inflammation"?? Resolution refers to the "shutting" down of a specific inflammation response. That's good new for all types of fibrosis and should be researched further for cystic fibrosis. What about the worst inflammation out there...that which is tied into Dementia and Alzheimer's? Good news there in CBD removing inflammation that drives build up amyloid plaques. The Aβ above is amyloid beta protein, the precursur to the plaques. Did we just read that right? the data strongly suggest that early intervention via the reduction of intraneuronal Aβ proteotoxicity may reduce AD disease initiation or progression. YOu can check out the research on CBD and Alzheimer's and Dementia here. That list of nasty sounding words are some of the immune response actors that cause damage when excessive. CBD markedly improved the clinical signs of at-EAE and reduced infiltration, demyelination and axonal damage. We only covered a few examples of research regarding CBD and inflammation. The idea is to show that CBD's effect appears to be systemic. Active on the entire system. The pathways and actors can be different (glial cells in the brain, mast cells in the gut, T cells in the blood) but the net effect was the same. 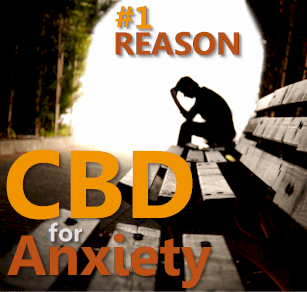 CBD calms the inflammatory response and brings balance and "resolution" to episodic responses. A recent study shows that CBD turns the immune response from a T1 (aggressive, attack) to T2 (stand-by, calmer) in the gut! We end where we started. In the gut. This is headquarters for for inflammation. CBD may have its greatest effect there. We'll have a CBD and the gut article soon! This depends on what we're trying to address. 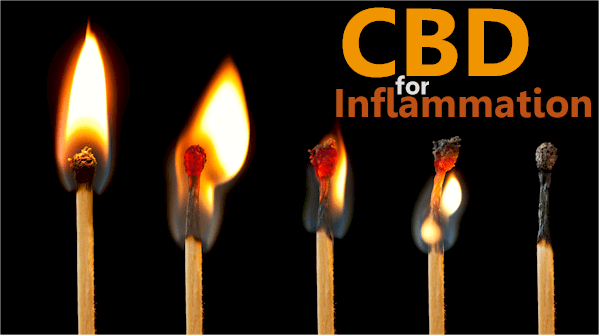 General inflammation may require a maintenance dosage of CBD. This generally runs 20-30mgs per day or even twice a day. 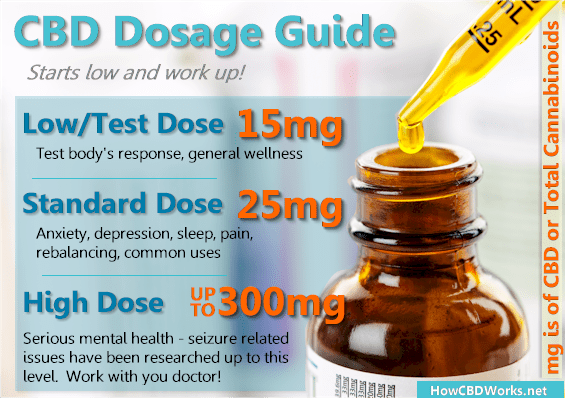 Keep in mind that CBD has been tested up to 300-600mg doses for most of the research above. It's even been tested up to 1500mg with a strong safety profile. You can learn more about CBD's safety here. If your inflammation is specific to a condition, higher doses might be more helpful. That's where the 300-600mg comes into play since inflammation can play a major role in dementia, arthritis, colitis, and many other illnesses. Keep in mind that CBD has not been cleared by the FDA to treat diseases or ailments. Make sure to let others know what works for you here. It's important to share what works with others! Pesticide, solvent, bacteria, mold free! 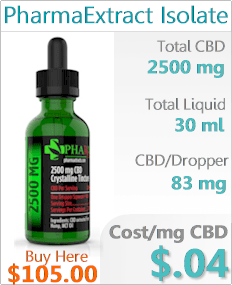 We also want purity of CBD and a high enough quantity (1000-2500mg is good range) per bottle. Otherwise, we're just taking a bunch of olive or coconut oil! The CBD oils are the most popular for inflammation unless the issues is specific to the skin or a given area (such as sprained ankle, etc). Also, we don't want to cause more issues in the histamine pathway (cause of allergic responses)! Histamines are released by mast cells and they're just another part of the inflammatory response. You can learn all about CBD and mast cell activation here. The oil is systemic - works throughout the body which is important. You can also see the CBD comparison here. Again, please let us know your results so we can publish them (anonymously) for others to learn from!